The gang at Twelve South, the company responsible for iPhone cases like the BookBook and stands for the iPad and MacBook Pro, has just unveiled their newest creation, an ingenious iPad/iPhone charger that seamlessly connects to a standard MacBook Air or MacBook Pro AC adapter. Twelve South sent us a sample unit, dubbed the PlugBug and we’re in love. It’s a simple idea with a winning premise of helping frequent travelers or those cramped for outlet space eliminate the need to carry a MacBook charger and a separate charger for a phone or iPad. Here’s how it works: Attach the PlugBug to the normal duck cover on any MagSafe power brick (which includes the MacBook, MacBook Pro and Macbook Air). 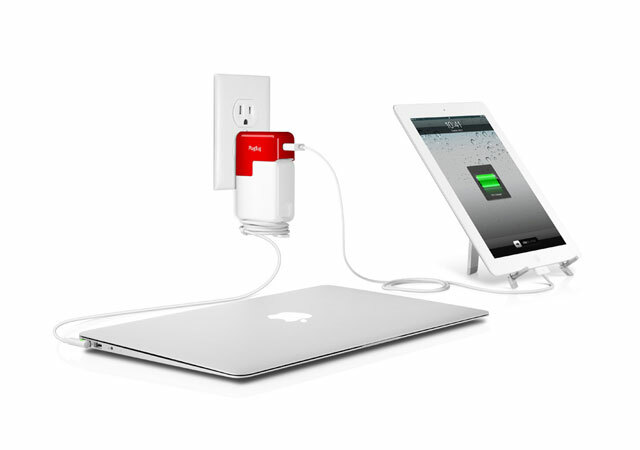 The PlugBug contains a two prong outlet and its own powered 10w USB port. What this means is that you can charge your iPhone or iPad without having to plug it into your laptop, all while also charging your laptop battery. First: That takes up an extra USB port. If you are using a MacBook Air, that might mean the device has to vie for space with other components. Second: It can take a lot more time to charge an iPad via your MacBook or MacBook Pro than through a wall connection. In fact, if your USB port isn’t powered, charging the iPad can take a ton of time. Third: For business travelers, this eliminates the need to pack the external phone or iPad charger alongside the laptop charger. At $34.95, this is a slick and relatively cheap device. It also doubles as a standard iPad charger — and considering Apple sells those for $29.99 (granted, the Apple model also includes a 6′ extension cord), we think this is a good deal. What I really like about this device is that it is styled to match the look and feel of the regular Apple adapter. Aside from its red cover, you would think this was a regular Apple dongle. It fits on the power port without adding much bulk, and the extra functionality of a powered USB port is great.